August was probably my most challenging month this year for a number of reasons. However, at the same time it was also the most eye opening. 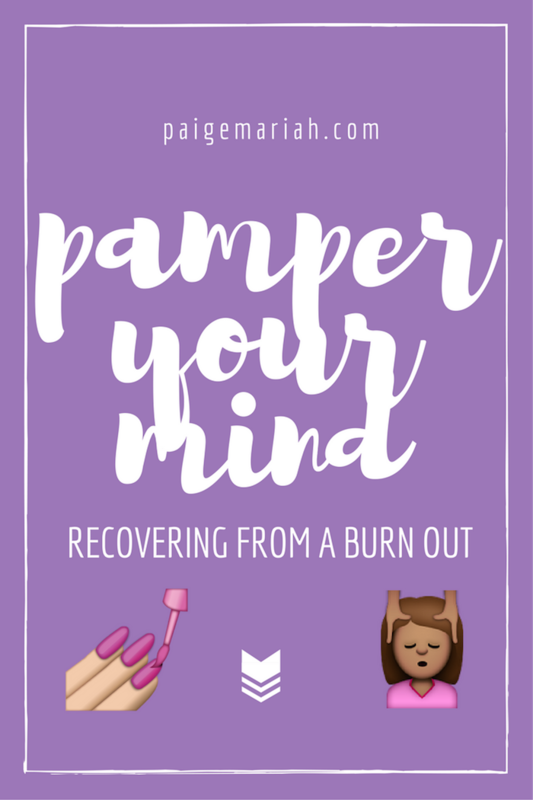 Click through to check out how I’ve been recovering from a burn out by “pampering" my mind! It can be really difficult to realize that you’re heading towards a burn out until you’ve already arrived there. I’ve always been a person that has to do everything. I have to write this blog post, I have to stop by this event, I have to edit this video...I’ve always jokingly said that life would be much easier if only it were possible for there to be two of me (even three). When in reality, instead of wishing that there were more of me to do the work, I should have been checking in with myself a lot more often. I felt like there was always something that needed to be done and convinced myself that the work that I was doing was never enough. So it may not be much of a surprise that over the last couple months I have gradually felt more and more drained. My blog posts began slowing down, I had no energy to really film and edit videos and I just couldn’t seem to stay dedicated to my nutrition and fitness. The fire that was once lit under me was dimming and it felt like there was nothing that I could (or even had the motivation) to do. A couple of weeks ago, I experienced something something totally unexpected and life interrupting. As heartbroken as I felt, you would think that it would have been the final straw. Strangely enough, this occurrence actually sparked some very necessary self reflection. I’ve reminded myself that there is nothing that I can possibly do to avoid adversity. There will be times where I’m going to feel completely exhausted while pushing towards my dreams. There will also continue to be times where things just seem to never go right. However, it is where I am mentally that will determine whether I am able to keep moving forward or spiral downwards toward rock bottom. That’s why it is so important to develop good habits that will keep your mind healthy. Be dedicated to treating your mind well and it will repay you by being strong during those difficult times. Check out these 5 tips for ways to “pamper” your mind. You deserve it! It has taken me a long time to not feel guilty for taking a break. Luckily, I now realize how important it is to do so! We all want to give our best effort and sometimes taking a little time to recharge is just necessary. Whether you go on a week long vacation with a friend or spend one entire day on the couch while reading a book- there is no work allowed during this break! Doing this regularly may even improve your work productivity by using this time off as an incentive or “reward” for getting things done. Prayer and meditation are also great ways to spend time on your break! Your tribe can certainly control your vibe! Spend time with people who understand your vision and want you to win. Their positivity will be contagious and you’ll feel great when you’re in their presence. Know when certain people or situations are toxic to your mind and don’t feel bad about walking from them. How you treat your body definitely has a huge effect on your mental health! Eating well and staying active will not only leave you looking great on the outside but you’ll feel wonderful on the inside as well. Exercise is an awesome way to relieve stress and clear your mind. Make it a priority in your weekly schedule and watch how things start changing! When you find yourself feeling drained or uninspired, it may be time to take a second look at your schedule/calendar. Do you really have to go to all 3 of those events this week? Can you fit in doing something you really love this weekend? Maybe you’ve just gotten bored with following the same routine. Don’t be afraid to go off track or even just switch things up a bit in the future. Whether you’re saying it to someone else or even yourself, learn how to say no. You don’t have to do everything. You don’t have to accept every project and you definitely don’t have to go to every event or party. Know when you’ve had enough and when you’re just doing way too much. The better that you get at saying no when necessary, the more comfortable you’ll feel saying yes when the time is right! Burn out is such a hard thing for me to recover from. It's a long process....maybe it wouldn't be so much if I use some of these ideas :) Normally I just turn to hours of video games lol! Love the Oprah GIF, sums everything up perfectly! And I definitely see exercise as an investment in your body and your health, both present and future. Great advice. I'm going through a period like that too...Really am glad I found your post. It is always better to do a little bit of research before narrowing down on the type of diaper that will suit your baby. See what type of diaper fits your baby and shop accordingly for a better experience.